Using the Offset tool, offset your closed shape by 8 inches to the outside. Make sure that nothing is selected by choosing Edit→Select None. Click once inside your shape. Click again outside your shape to make a second, bigger shape. Type 8 and then press Enter. 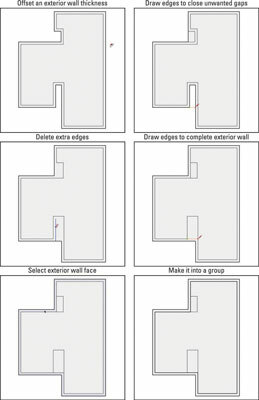 Because the exterior of the house doesn’t actually have any alcoves, use the Line tool to close them off, creating pockets of wall that are thicker than the rest. Use the Eraser tool to get rid of the extra edges. By deleting the extra edges, you have only two faces: one that represents the floor and one that represents the wall. With the Line tool, draw edges that define the thickness of your exterior wall. In the case of this house, this means separating the bulges (which actually represent a fireplace and a mechanical closet) from the part of the wall that goes all the way up to the roof, two stories up. When you’re done, you end up with several faces: one for the floor, one for the exterior wall (whose thickness should be more or less uniform), and a few for the bulges. Select the face that defines the exterior wall. The easiest way to do this is to click once on the face with the Select tool. Make the face you just selected into a group. Making groups lets you separate different parts of your model. Turning your exterior wall into a separate group makes it easier to edit, hide, and move. Groups also simplify the process of adding more levels to your building, if that becomes necessary. To turn the face you selected in Step 5 into a group, choose Edit→Make Group. You see a perimeter of blue lines around your face; that’s the group you just created.